The purpose of the auditorium was to provide a larger venue in which to hold the large scientific symposia, meetings, and lectures that could no longer fit in the Lecture Room or the Great Hall. In the century since the founding of the Academy, membership had grown as it broadened its membership to include new fields, such as the social sciences. As with the east and west wings, the firm of Harrison and Abramowitz was chosen as architect for the auditorium. Harrison's acoustical advisor was Cyril M. Harris of Columbia University who was later elected to membership in the National Academy of Engineering (1975) and the National Academy of Sciences (1980). Harris later designed the acoustics of the John F. Kennedy Center for the Performing Arts, the Metropolitan Opera House, and Avery Fisher Hall in Lincoln Center. For the Academy auditorium, Harrison used a dome design similar to one he had designed for the Caspary Auditorium at Rockefeller University about fifteen years earlier. Unlike the Caspary dome, which is visible as a dome from the exterior, the Academy dome is housed within an enclosing hip-roofed rectangular structure that recreates the sense of mass conveyed by Goodhue's original building. This is reinforced by the simplicity of the north-facing windowless façade, the stonework of which harmonizes with the north faces of the wings flanking it. As with the east and west wings, continuity with the original structure was an overriding aesthetic objective, and was successfully attained. The interior of the dome features a novel surface made up of 70 adjoining diamond-shaped projections covered in plaster. These projections, which were fabricated in place, are arranged along cycloid-shaped curves. The resulting configuration of the interior wall and ceiling eliminates acoustic focal points and thus ensures an optimal distribution of sound. This interior shell is suspended from trusses above the ceiling, thus isolating the shell from the auditorium floor and exterior structures. 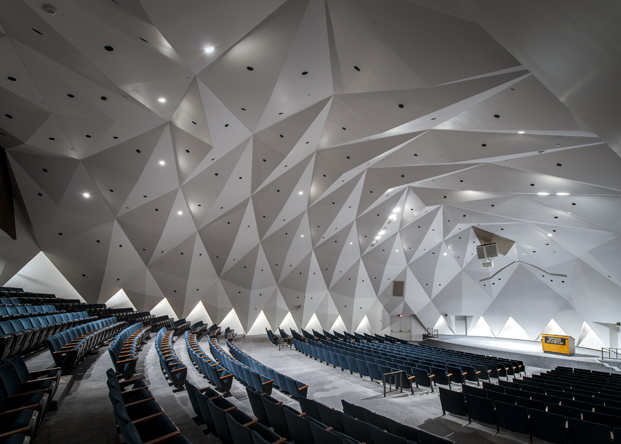 Taken together, the arrangement of the triangular projections and the independence of the acoustical shell from much of the rest of the structure ensure an acoustic efficiency that makes the auditorium nearly ideal for oral presentations and an excellent setting for music. The auditorium after the building's restoration © 2012 Maxwell MacKenzie. The 670-seat auditorium is used for scientific symposia and national and international meetings. At the NAS Annual Meetings, the induction ceremony for new members, the business meetings, and symposia have been held here since the auditorium opened in 1971. Three sitting Presidents of the United States of America have addressed the members in the auditorium at its Annual Meeting on the importance of science to society: Jimmy Carter in 1979, George H.W. Bush in 1990, and Barack Obama in 2009 and 2013. In addition, President Bill Clinton selected the NAS auditorium for two press conferences. The hall also provides an excellent setting for music, and is used for private concerts during the Academy's annual meetings, as well as for the series of free concerts for the public sponsored by the Academy through its office of Cultural Programs of the National Academy of Sciences. The Academy's archives collections, which encompass the entire span of the Academy's history from its founding in 1863, are maintained in two climate-controlled storage areas in the auditorium wing's mezzanine area and second floor. The archives contain the corporate records of the Academy and a unique record of the history of science in the United States. Although the additions of the two wings and the auditorium significantly increased the Academy building's size and architectural footprint, the sense of proportion and balance inherent in Goodhue's original design was not compromised. With all three additions, unity of exterior design was a priority. This was accomplished in part by a replication of the original façade's stone pattern, and in the case of the auditorium, by the installation of a reproduction of the original building's copper cheneau. The original building's unity of exterior and interior design elements—seen, for example, in the continuities of color and material in the main entrance foyer—was also maintained in many parts of the additions. Although the auditorium wing's C Street lobby departs from the rest of the building in having a more overtly modern style, the entrance from C Street maintains the building's color scheme through its Verde Issogne marble floor. From the outside, despite the addition of three wings the overall effect is of a single building unified in its exterior aspect. On April 17, 2017, the National Academy of Sciences announced that it received a $10.5 million gift from The Kavli Foundation to establish the Fred Kavli Endowment Fund, which honors the late physicist, entrepreneur, innovator, business leader, and philanthropist. To recognize Kavli’s generous and unwavering support for science, the auditorium of the historic National Academy of Sciences Building was renamed the Fred Kavli Auditorium. Read the press release.